How Do You Find Your Lipstick Color? Shades can be light, medium, and dark. 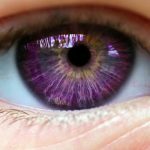 For gray eyes, of course you want shades of beige or plum. For blue eyes – beige-pink and shades of cherry. People with green eyes should use terracotta and red-orange shades, and for hazel eyes, you should try to choose brown, bright red, and light pink shades. Of course, with all of this you should also consider skin color. If you have darker skin, then chocolate, wine, red, plum, and pastel tones will fit well. For light skin, you should choose beige, light coral, and light pink shades. A general rule – if your skin tone is warm (peach, cream, ivory), then the shade of lipstick should be warm as well. With cold tones, accordingly, choose cold tones of lipstick. This rule applies to choosing lipstick that matches with the color palette of your outfit and your makeup. A warm color palette would show off colors from yellow the light brown, cold colors would be green and blue. In addition to these tones, there are also neutral tones, which can be beige, gray, and black. Neutral lipstick tones match both warm and cold color palettes for outfits. For pastel tones, choose a cold colored lipstick. Blondes with blue or green eyes and fair skin can wear all shades of pink, plum, and coral. Especially bright colors are not recommended. Blondes with hazel or chestnut eyes should look for gentle shades of pink and red. Bright red and bright pink are not recommended. Blondes with a golden skin tone should look for beige-gold tones. Ladies with red hair with fair skin can use plum, dark red, brown, and coral colors. Orange and bright pink shades are not recommended. Brunettes with whitish-pink skin should use pink, dark pink, plum, and light brown colors of lipstick. Brunettes with gray or blue eyes and fair skin should choose classic scarlet or lily colors. Brunettes with dark colored eyes and dark complexion should look for plum, chocolate, orange, and dark red colors. Shades of the medium variety, in general, should work for everyone. Darker shades are better for women with dark hair and skin. Those possessing white teeth are given a lot of freedom, and should only worry about color types. Yellow teeth force you to be much more careful with your choice of lipstick. Purple is not recommended, along with brown or bright red. Auburn shades would be preferred, along with light red and natural pink. Light shades of lipstick and lip gloss pull attention away from imperfect teeth. Light colored lipstick visually increases the size of lips, whereas dark colors decrease. 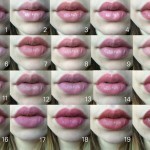 If you would like to increase the size of your lips, be sure to trace them with the same color of lip liner as lipstick. Apply the lipstick with a small brush and add some gloss to the middle of the lips. 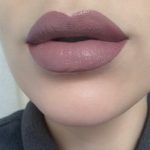 With this technique, you should put more gloss on the lower lip than the upper. You can also add some highlight above the upper lip, being sure to spread it evenly. 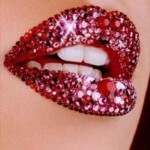 Keep in mind that pearlescent lipstick will highlight any flaws in your lips and increase their size. Therefore, if your lips are in bad shape, it’s better to use a matte lipstick and for the evening, use gloss. 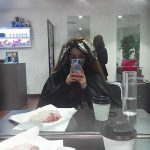 Lighter shades are recommended for younger girls, for young women, rich colors (keeping in mind the time of day), and for older women, darker colors, but nothing too loud or that is too suggestive. Pastel colors accentuate wrinkles less than others. During cold light conditions (winter skies, neon lights), it’s not recommended to use cold shades. However, with warm light conditions (incandescent light, candle) – use brown tones.